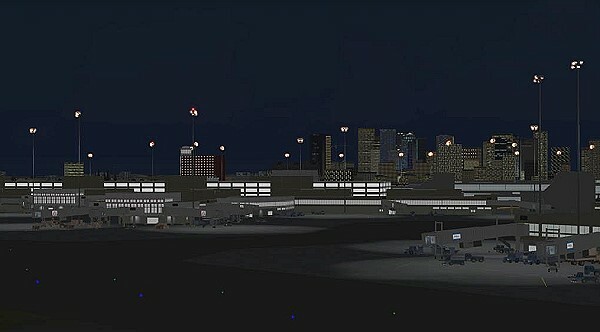 BluePrint’s rendition of KBOS is by far the most accurate and detailed ever produced for the Microsoft flight simulator. As usual, special attention was paid to the terminal complex. Our scenery includes all four terminals, the control tower, the parking structures and all major general aviation facilities. A few landmarks in the airport’s immediate vicinity were also included for the sake of increasing realism during air and taxi operations. As usual, high-resolution textures were used in all major buildings including transparency and reflection effects in the FSX version. 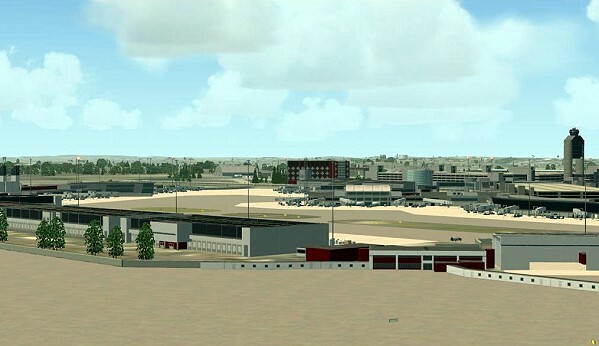 A high-resolution terrain elevation mesh is included as an option in the FS2004 version. This feature was not needed in the FSX version as the highest resolution mesh was already used in the Boston area by default. Customized high-resolution terrain texturing displaying seasonal changes was used in both versions of the scenery. 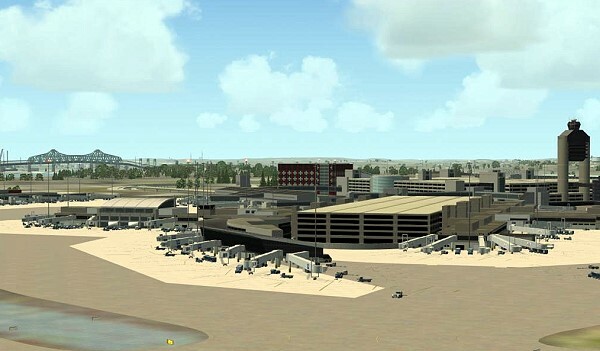 The texture-replacement area in the FS2004 version is nearly four times larger than that covered in the FSX version in order to ensure optimum bending with the complex coastline depicted in the surrounding default terrain. Special attention was paid to the accuracy of the field’s layout including all six runways as well as taxiways and ramps. A few new and improved models are used for some of the most important auxiliary equipment located around the field including approach lighting (both horizontal and vertical guidance), VOR beacon, and runway hold-short warning lights. As in previous sceneries, three levels of detail have been implemented in order to provide options suitable to older computer systems. A detailed description of this feature is provided below. Unfortunately, the tricky coastal geography surrounding BOS and the proximity of the runways to the water posed a new challenge to our ability to match terrain elevation and terrain texturing despite using the latest and most accurate data available to the public via NASA and the USGS. While disappointed by the obvious terrain discrepancies clearly visible at various points along the coast line, we decided to avoid fake modifications to the satellite image used as ground texture. It is worth noting that the discrepancies are due primarily to the resolution of the terrain mesh that can be handled by the simulator at this time rather than the terrain texturing itself. Nonetheless, we are extremely proud to offer a scenery add-on that will undoubtedly capture the imagination of the great majority of computer pilots. 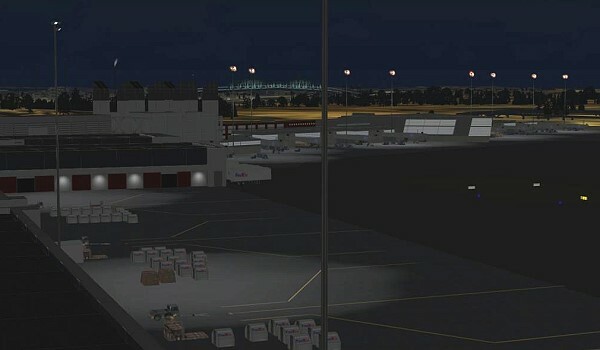 Realistic taxiway and ramp markings and ramp illumination effects. 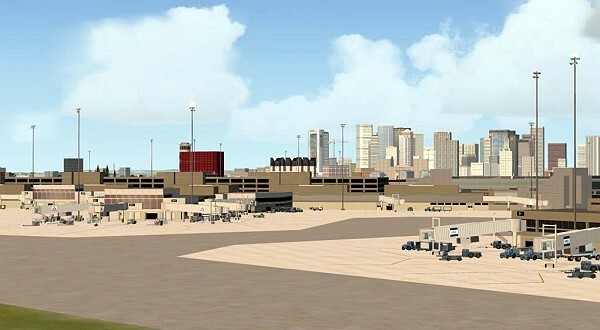 NORMAL complexity includes terrain texturing, autogen vegetation, airport layout with taxiway signs and basic navigation equipment models (actual localizer and glide slope radio signals are available regardless of the scenery complexity setting), most buildings within the field’s boundaries including the four terminals, the air traffic control tower and general aviation, cargo and maintenance facilities. VERY DENSE complexity adds detailed instrument approach lighting system models, static ramp vehicles (optional) and infield trees (optional). 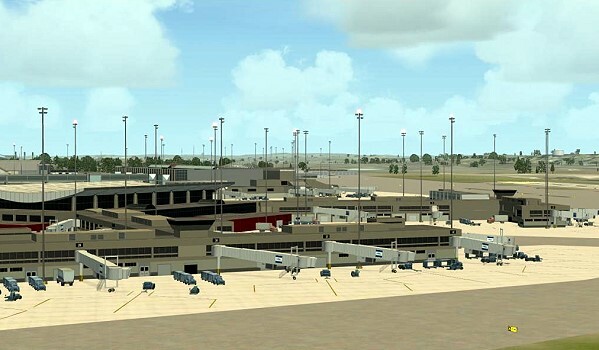 EXTREMELY DENSE complexity adds 33% more static ramp vehicles (50% in the FSX version) and detailed trucks and cargo containers in the general cargo ramps. It also adds all elevated airport access roads. EXTREMELY DENSE complexity setting is recommended for computer systems equipped with advanced CPUs (Intel Core2 Quad) and video rendering resources (nVidia GeForce 8000 series or better). For suggested hardware configuration see below. Advanced, custom-made AI mapping file including realistic gate and parking spot layout and airline gate assignments. A basic AI mapping file without gate assignments is also available as an option. 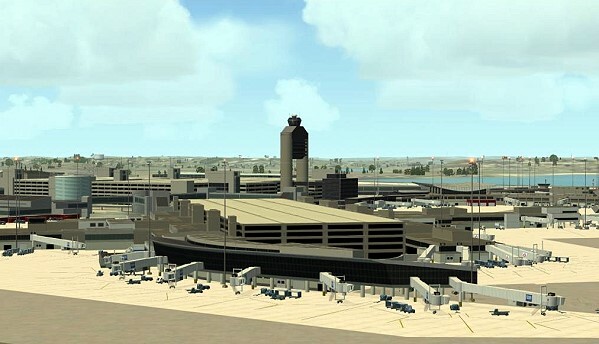 IMPORTANT NOTE: The FSX version is not compatible with the default animated jetways and aircraft service vehicles. 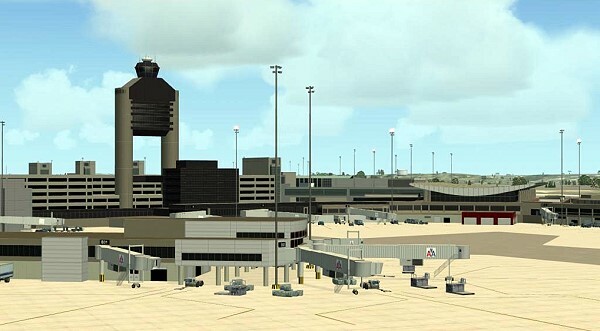 Gate configuration is depicted accurately including individually customized jetways. In most cases, the available space around the parked aircraft cannot accommodate the default vehicles. An alternate set of static vehicles is provided as an option. nVidia 7000 series video processor with 256-bit memory interface and 512 MB dedicated video memory or better (nVidia GeForce 7950 GT fully tested). An Intel Core2 Quad and nVidia 8000 series video processor may be required for best performance when using the EXTREMELY DENSE scenery complexity setting (Intel Core2 Quad Q9300 @ 2.50 GHz and nVidia GeForce 8800 GT fully tested). Please note that default vehicle models have been used in both versions of the scenery. Nonetheless, due to the large number of them needed to achieve the desired effect, addition of vehicles has by far the most significant effect on frame rates and overall performance of all scenery components. The same, although to a lesser extent, applies to additional trees included in the FSX version. 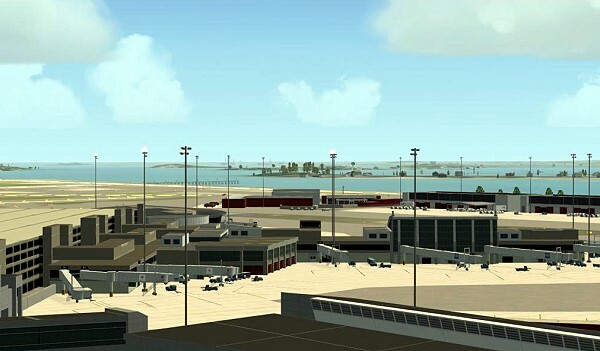 Removing a significant number of them by using a VERY DENSE or lower scenery complexity setting or removing them completely by leaving them out during scenery installation is the most effective way to improve frame rates and overall performance of this scenery specially in the FSX version.